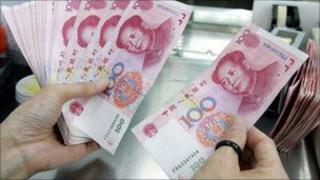 A BBC World Service survey has found that developed nations are increasingly fearful over China's economic power. The survey was carried out by the international polling firm GlobeScan/PIPA among more than 28,000 people in 27 countries. It revealed that the numbers of those who say that China becoming more powerful economically is a bad thing have increased substantially. That economic success helped the Chinese energy giant Sinopec's profits to surge. The company reported a jump in profits driven by an increase in domestic demand and rising oil prices. Asia's biggest refiner by capacity said its net profit grew by 13.7% to 71.8bn yuan ($10.9bn; £6.8bn) last year. Meanwhile, in Hong Kong, investors who lost money after the collapse of investment bank Lehman Brothers will be repaid by Hong Kong banks. Sixteen banks have agreed to buy back financial instruments they sold to investors for up to 96.5% of their value. Away from Asia, the drugs giant AstraZeneca struck a tax deal with the US and UK tax authorities over its tax bill. As a result of the agreement, AstraZeneca will pay a net amount of $1.1bn (£690m) to cover US tax payments between 2000 and 2010. As this was less than the firm had expected, the company said the deal would help to increase its earnings this year. In the UK, a survey by the BBC showed that people's take-home pay had fallen by 5% in the past two years. The average employee takes home £1,088 a year less than two years ago when the sum is adjusted for inflation, research commissioned by BBC Panorama suggests. The sharp drop, in real terms, highlights the effect of stagnant wages and above-target inflation on incomes. Finally, for a look behind the business headlines, click through to BBC World Service's Business Daily podcast where there's more on the survey about China's economic power, and reaction from influential thinkers in the US and Brazil on whether its growing might is a problem or an opportunity.